What comes to your mind as you think about March? It probably depends on your age, geographical location, and love level for the game of basketball. What started in 1939 with eight men’s basketball teams has now grown into a massive field of 68 for the ‘big dance.” Fan interest in this championship tournament grew in the 1970s and exploded in the 1980s. CBS broadcaster Brent Musburger first used the phrase “March Madness” in 1982, a term coined years earlier by an Illinois high school basketball referee. Now it transcends sports and penetrates pop culture; every able American must fill out their brackets! Through the years, HydroWorx has played a role for many teams as they’ve prepared for the grueling, end of the season battle for the top spot. In 2015, Duke University had a stand-out player who suffered an ankle injury mid-season. A major focus of his rehabilitation was performing exercises in the HydroWorx pool at Duke under the care of the athletic training staff. He had used the pool in the past as a vehicle to obtain additional conditioning on top of his regular workouts, so he was previously familiar with the pool’s intrinsic benefits. Two days after spraining his ankle, this athlete began aquatic therapy treatment, including walking on the integrated underwater treadmill. Jeff Boyer, athletic trainer for the University of Virginia, worked with the men’s basketball team and utilized the HydroWorx 500 Series, PolarPlunge and ThermalPlunge pools. “An athlete who had his ankle scoped started training in the pool about a week after surgery. We worked on intrinsic foot movement using the hand rails at first. He progressed to walking, emphasizing the heel-toe gait. Then we progressed to jogging, double leg jumps, back peddling. Then we started more intensive jogging and sprint intervals, just trying to get him ready to basically do the same things on the court. We utilized the 50% non-weight-bearing environment to begin this rehab process to get not only his ankle, but the rest of his body used to running, cutting and jumping again, everything he needs to do on the court. Kylea Sheley, trainer for the University of South Dakota, advocates the use of aquatic therapy for her student-athletes. “The HydroWorx pool is one of our favorite pieces to show off to people as they come through our facility,” said Sheley. “Our prospective student-athletes see that we’re working with cutting edge technology and want to come to a place that invests in their health. Sheley noted that this athlete worked so vigorously in the pool that when she was cleared for weight-bearing activity, she was fully ready to practice on the court, having lost no cardiovascular endurance. Curtis Self and Ben McNair, Creighton University athletic trainers, have their athletes try cuts, jumps, slides and sprints in the HydroWorx pool before testing an injury on land. The madness starts Tuesday, March 19 and ends with the championship game on Monday, April 8. 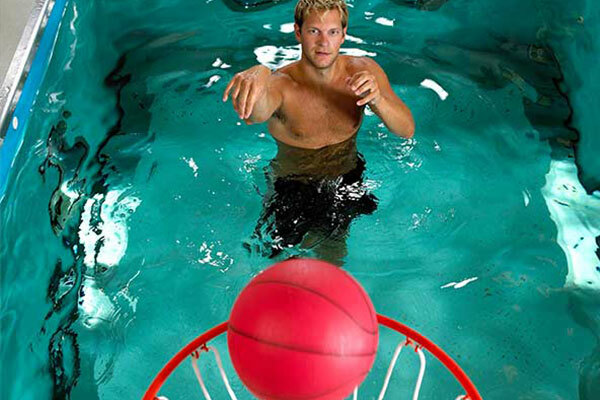 During the tournament, when you see a previously injured athlete nail a three, lead a fast break, or drop points on the foul line, realize this: aquatic therapy may have played a role in his rehab!